Tiny white spots all over shrimp... Bacteria? First post here and very new to shrimp care. Have a planted tank with a handful of red rilis, some small guppies, and a few inevitable snails. I read through the stickied shrimp disease thread and couldn't find anything that described my problem. I noticed a couple of my shrimp showing tiny white dots all over their shell. It looks almost like the ich that wiped out some tetras a few months back (haven't seen it since... Treated the tank, let it cycle with no fish for 4 weeks, new fish aren't showing any signs of it). Nobody has died, they seem to act the same, eat the same, etc. Now I may be mistaking a natural coloring here, I'm very new to dwarf shrimp. 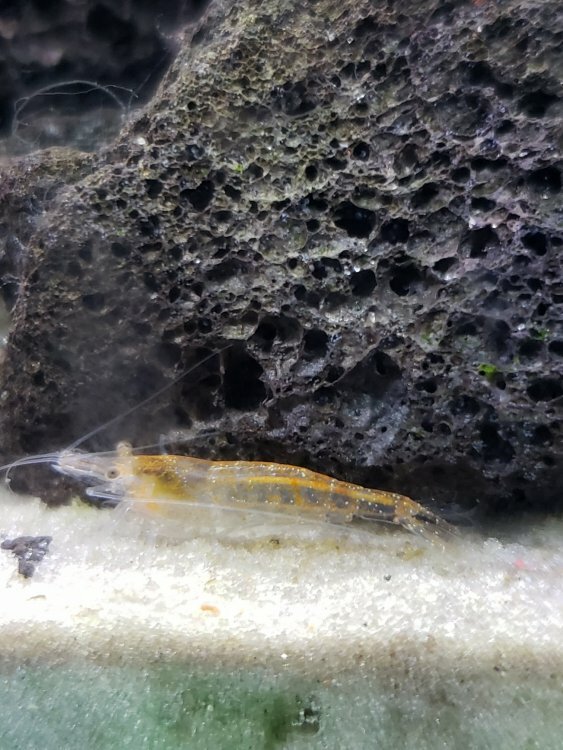 I am, however, dubious because it showed up on a different sub-species, whose picture I attached below (not sure what he is... came in the bag as a baby with some red rilis from the store). Also I can try to get more pictures if it would help. Any thoughts would be appreciated! I've lurked on a few other threads and the info has been great so far! How old/new is the tank? If you are picking up an ammonia reading, that's not good for the shrimp. The white spots might be a reaction to ammonia. Thanks, Jayc. Ill keep an eye on the ammonia, do a water change, see what happens. Looks a bit down from my last test. Tank is about 3-4 months old. Cycled for a month to start before putting shrimp in. Did you ever get pictures of the other shrimp?